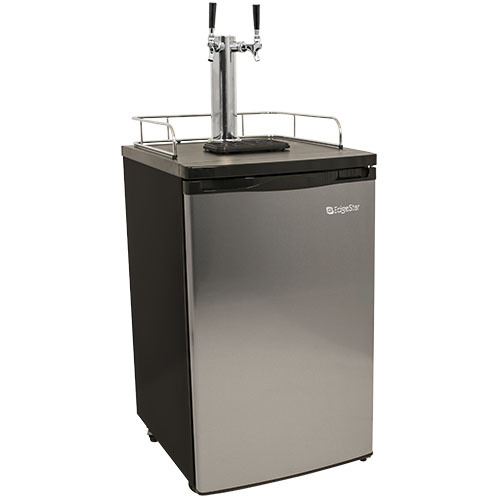 Set up a home or commercial brewing system to serve cold draft beer using the EdgeStar Ultra Low Temperature Full Size Kegerator & Keg Beer Cooler (KC2000TWIN). EdgeStar full size kegerators are capable of reaching temperatures in the low 30s, making them the coldest of any kegerators on the market. 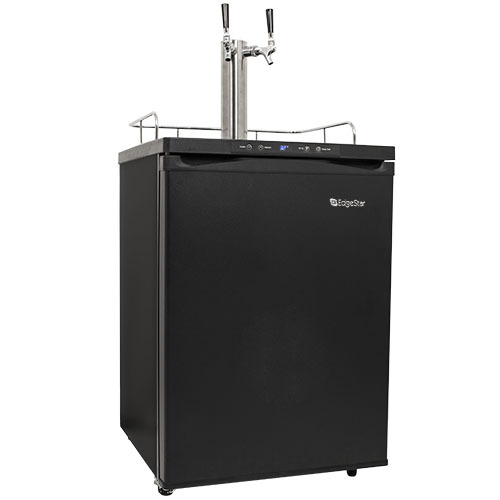 Ideal for seasoned beer enthusiasts looking for a reliable kegerator before spending a fortune on a commercial unit, or people who are just starting out. 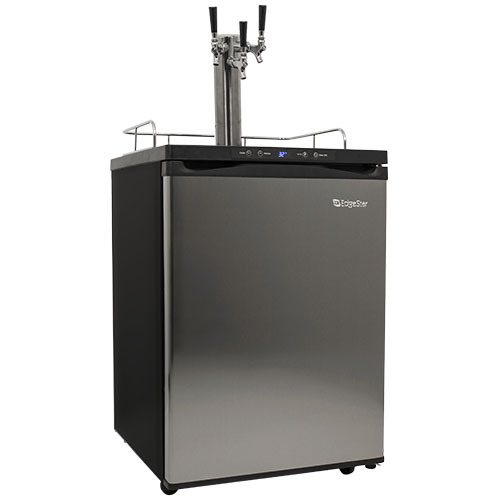 The EdgeStar full size kegerator is an excellent value, combining a designed-to-fit refrigerator with commercial-grade, NSF-approved beer and air lines. All the beer components are high-quality parts that include a Domestic D coupler, CO2 regulator, stainless steel draft tower with faucet, beer and gas line and a new aluminum CO2 tank (empty). The elegance and quality of the Perlick 24" Outdoor Single Faucet C-Series Beer Dispenser (HC24TO-3-2L1) is immediately apparent. 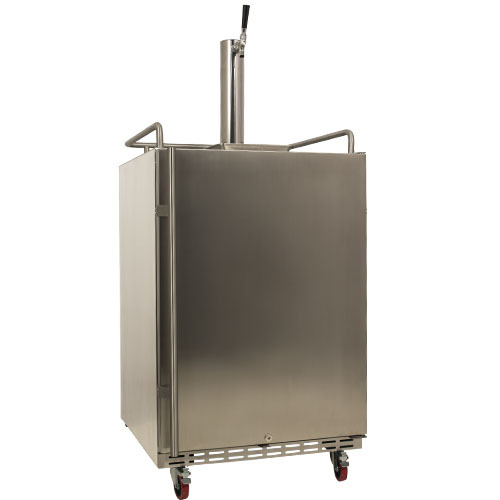 Made in the USA, the dispenser features a high-quality commercial-grade stainless steel interior and exterior. Additionally, the model features a stainless steel door that may be personalized with a custom wood overlay to match surrounding cabinetry and finishes. Inside, the dispenser keeps kegs perfectly chilled with a front-vented RAPIDcool forced-air refrigeration system, which keeps your brewery-fresh beer between 33 and 42 degrees Fahrenheit with the help of a commercial grade electromechanical temperature controller. 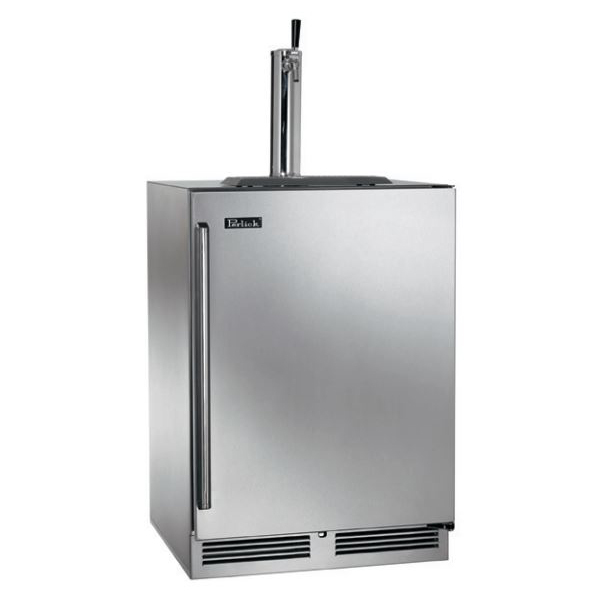 Thanks to air-cooled dispensing towers that keep the beer lines cold, any beer that pours forth from the 630SS stainless steel faucet will be the perfect temperature every time. Rest easy knowing that the dispenser is UL-rated for outdoor use, making it perfect for additions to backyard islands and kitchen setups. 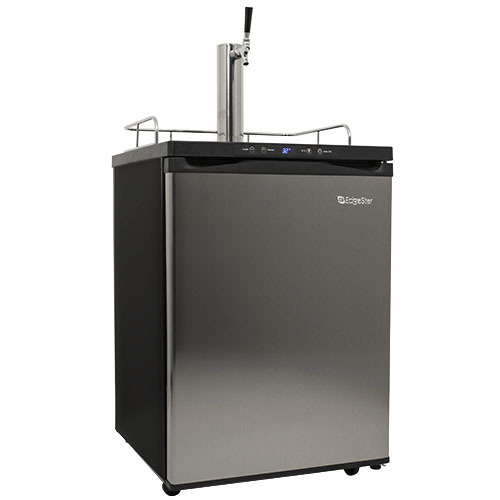 The dispenser comes standard with a low profile "D" system keg coupler, though may be fitted with different couplers depending on the type of beer. The dispenser also features a zero-clearance hinge that allows it to fit in completely flush with any counters around it. A digital control module ensures that the dispenser is easy to set to the perfect temperature for a variety of beers. Though the dispenser features a compact form-factor, it still offers enough space for one 1/4 barrel or two 1/6 barrels. Each time you open your faucet, your glass will fill with crisp, refreshing beer, air-cooled to a perfect chill between keg and glass, and a portable drainer will catch any accidental overflow without the need for extra plumbing. Made in the USA:Domestic, high-quality design and materialCustom overlay:Overlay door accepts custom wood panel, not included (Note: image shows stainless steel door) Commercial grade:Made from the highest quality of stainless steel RAPIDcool:Front-vented, forced-air refrigeration ensures the perfect brew temperature Digital control:A digital control module makes it easier than ever to adjust internal temperatures UL-rated:Tested and designed for outdoor use *Please note: Due to the interior dimensions of this unit a full-size keg will NOT fit into this unit. The elegance and quality of the Perlick 24" Outdoor Dual Faucet Signature Beer Dispenser (HP24TO-3-2L2) is immediately apparent. Made in the USA, the dispenser showcases a high-quality commercial-grade stainless steel that makes up the interior and exterior of the handsome device, whose door may be personalized with a matching custom wood panel to fit in to surrounding cabinetry and finishes. 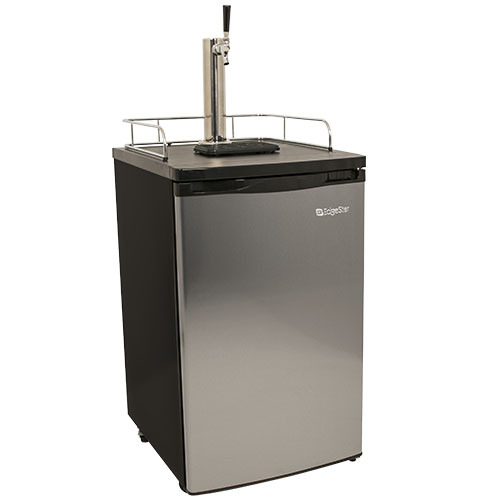 And when you pour your brew from the 650SS stainless steel flow-control beer faucets, you'll know that it is perfectly chilled by the dispenser's front-vented RAPIDcool forced-air refrigeration system, which keeps your brewery-fresh beer at a constant temperature between 33 and 42 degrees Fahrenheit. Air-cooled dispensing towers keep your beer lines cold and make sure libations are perfectly chilled all the way through the faucet. Additionally, with the twist of the flow control lever on the faucet, you can easily adjust the speed of the pour, slowing down heady beers such as hefeweizens for a perfect pint every time. Rest easy knowing that the dispenser is UL-rated for outdoor use, making it perfect for additions to backyard islands and kitchen setups. 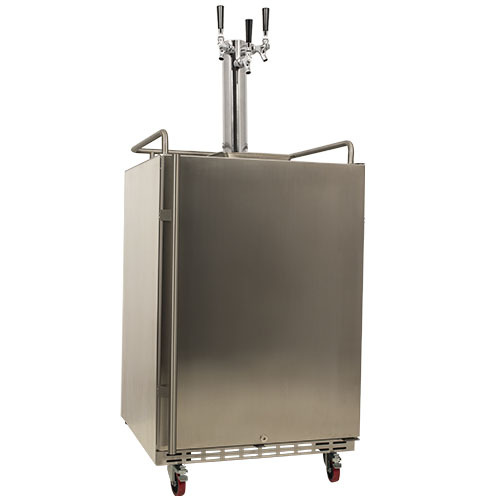 The dispenser comes standard with a low profile "D" system keg coupler, though may be fitted with additional couplers depending on the type of beer. The dispenser also features a zero-clearance hinge that allows it to fit in completely flush with any counters around it. A digital control module ensures that the dispenser is easy to set to the perfect temperature for a variety of beers. Though the dispenser features a compact form-factor, it still offers enough space for one 1/4 barrel or two 1/6 barrels. As you open the faucet, your glass will fill with crisp, refreshing beer, air-cooled to a perfect chill between keg and glass, and a portable drainer will catch any accidental overflow without the need for extra plumbing. Made in the USA:Domestic quality of design and materialCustom overlay:Overlay door accepts custom wood panel, not included (Note: image shows stainless steel door) Commercial grade:Made from the highest quality of stainless steel RAPIDcool:Front-vented, forced-air refrigeration ensures the perfect brew temperature Flow control:Easily control pour speed with an on-faucet lever Digital control:A digital control module makes it easier than ever to adjust internal temperatures UL-rated:Tested and designed for outdoor use *Please note: Due to the interior dimensions of this unit a full-size keg will NOT fit into this unit. 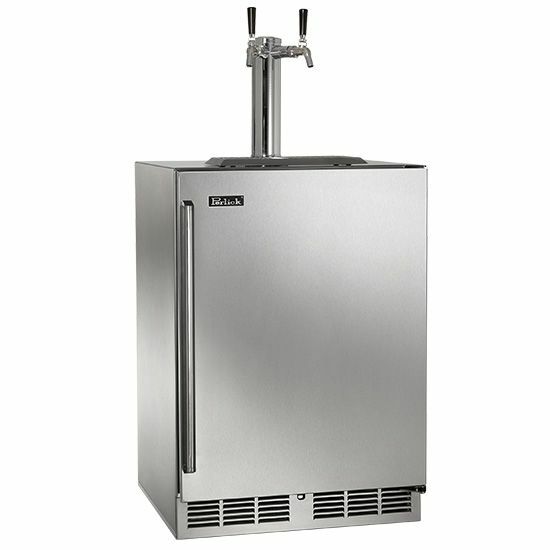 An excellent value for those that brew their own beer and those that like to get kegs filled at breweries and brewpubs, the Edgestar Ultra Low Temp Home Brew Stainless Steel Dual Tap Kegerator with Kegs (KC2000SSTWINHBKG) gives you the power to serve handcrafted brew on tap in your own home. 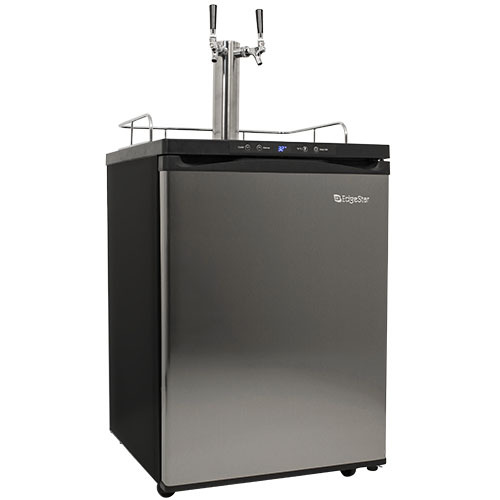 This full size kegerator comes with commercial-grade components, including a 5 lb. CO2 cylinder (supplied empty), regulator, stainless steel draft tower, faucets, tap handles, standard D couplers that will fit most commercial kegs, and beer and gas lines that are USA-made and NSF approved. The kit also comes with two (2) home brew conversion kits that allow you to dispense from the two (2) included empty reconditioned ball lock Cornelius kegs (CK1-CL1) while retaining the ability to dispense from commercial kegs as well. In addition, this kegerator is UL listed, so you can be assured of your safety using this product. 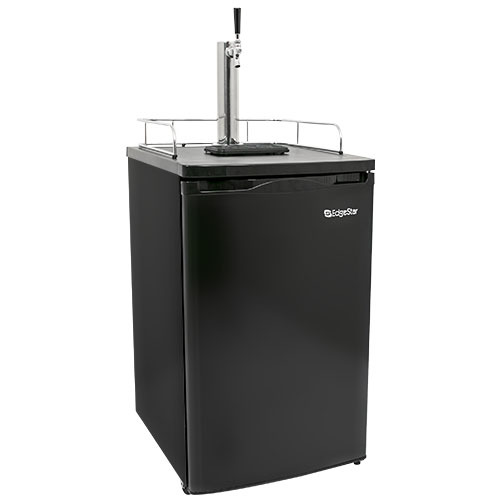 This full size beer refrigerator is capable of holding a standard full size 1/2-barrel keg and is also designed for easy set up, making it perfect for seasoned kegerator pros as well as those who are unfamiliar with home draft beer systems. Ideal for in-home settings, this versatile kegerator can be used in your home bar, kitchen, game room or anywhere else that you like to entertain. Able to Tap Commercial and Ball-Lock Kegs: This kit includes everything you need to tap a commercial kegs or the included ball-lock kegs What's Included: Ships complete with all components needed to tap a commercial or Cornelius/ball lock keg: 5 lb. CO2 cylinder, regulator, two (2) standard D coupler, two (2) home brew conversion kit, tower, beer line, gas line, drip tray, faucet, tap handle and two (2) empty reconditioned ball lock Cornelius keg (CK1-CL1). Ultra Low Temperature: EdgeStar full size kegerators are capable of reaching temperatures in the low 30s making them the coldest kegerators out of any on the market US-Made, NSF Approved Components: All the components are made here in the USA and the tower, faucets, handles and hoses are NSF approved Integrated Casters: The heavy-duty casters attach easily to allow for easy movement UL Listed: Approved by the most trusted source for product compliance in the world We strongly recommend purchasing a cleaning kit with this full size kegerator. Beer equipment should be cleaned after every keg. 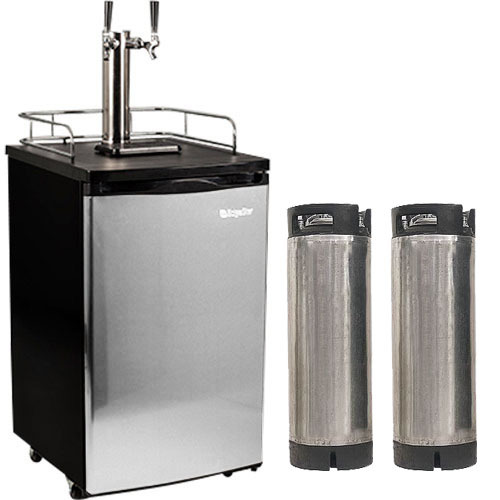 An excellent value for those that brew their own beer and those that like to get kegs filled at breweries and brewpubs, the Edgestar Ultra Low Temp Home Brew Dual Tap Kegerator with Kegs (KC2000TWINHBKG) gives you the power to serve handcrafted brew on tap in your own home. This full size kegerator comes with commercial-grade components, including a 5 lb. CO2 cylinder (supplied empty), regulator, stainless steel draft tower, faucets, tap handles, standard D couplers that will fit most commercial kegs, and beer and gas lines that are USA-made and NSF approved. The kit also comes with two (2) home brew conversion kits that allow you to dispense from the two (2) included empty reconditioned ball lock Cornelius kegs (CK1-CL1) while retaining the ability to dispense from commercial kegs as well. In addition, this kegerator is UL listed, so you can be assured of your safety using this product. 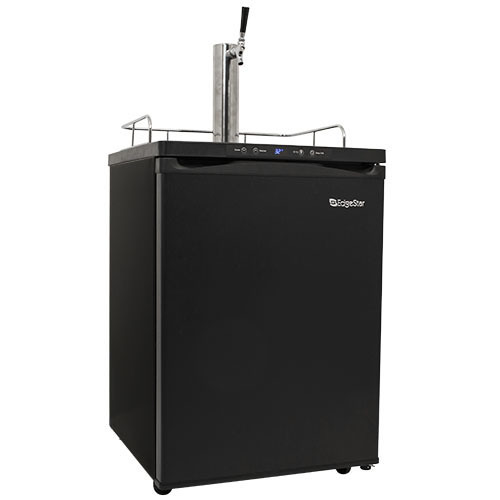 This full size beer refrigerator is capable of holding a standard full size 1/2-barrel keg and is also designed for easy set up, making it perfect for seasoned kegerator pros as well as those who are unfamiliar with home draft beer systems. Ideal for in-home settings, this versatile kegerator can be used in your home bar, kitchen, game room or anywhere else that you like to entertain. 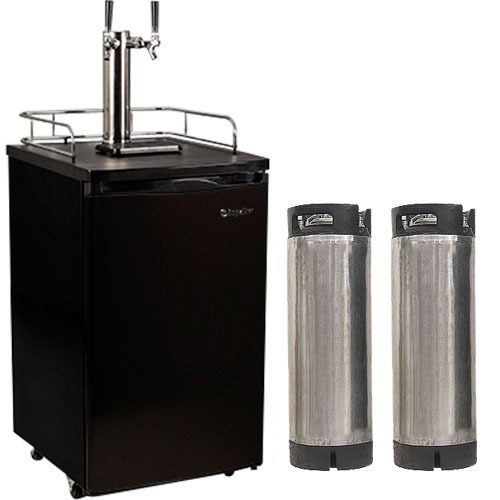 Able to Tap Commercial and Ball-Lock Kegs: This kit includes everything you need to tap a commercial kegs or the included ball-lock kegs What's Included: Ships complete with all components needed to tap a commercial or Cornelius/ball lock keg: 5 lb. CO2 cylinder, regulator, two (2) standard D coupler, two (2) home brew conversion kit, tower, beer line, gas line, drip tray, faucet, tap handle and two (2) empty reconditioned ball lock Cornelius keg (CK1-CL1). Ultra Low Temperature: EdgeStar full size kegerators are capable of reaching temperatures in the low 30s making them the coldest kegerators out of any on the market US-Made, NSF Approved Components: All the components are made here in the USA and the tower, faucets, handles and hoses are NSF approved Integrated Casters: The heavy-duty casters attach easily to allow for easy movement UL Listed: Approved by the most trusted source for product compliance in the world We strongly recommend purchasing a cleaning kit with this full size kegerator. Beer equipment should be cleaned after every keg. *When empty, it is recommended that you keep the temperature between 35-38F.